November 2nd will be a special day. 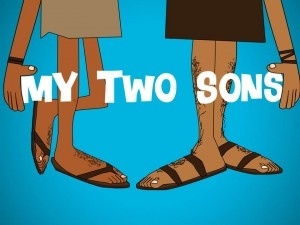 A really special day for me and my two sons. Why you ask? 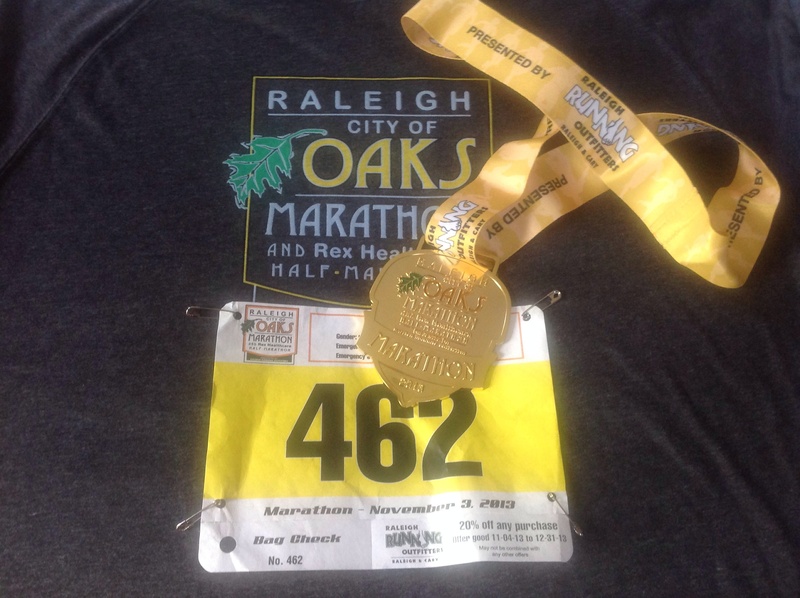 We will be toeing the line as Dad and sons at Raleigh’s City of Oaks Rex Healthcare Half Marathon. I couldn’t be more happy about it. This is my hometown marathon, half and 10k. The race that is currently my PR at the marathon distance. A mark that I set in 2013. 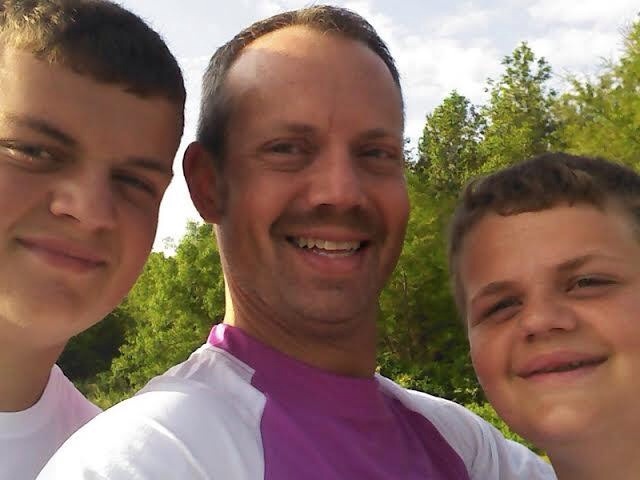 This year however, I chose to run the Half Marathon with my 16 and 18 year old sons. I am not going to try to better my time from last year in the marathon. In fact, I just didn’t come close at all this year in achieving that new marathon PR. My best marathon this year was about nine minutes shy of a PR. My goal this year is to run with my kids. I am not really sure what to expect come race day. My older son has run two Half marathons to date. This will be his third. He has run his other two half marathons this year. His first in Hilton Head, SC, back in February, finishing in 1:43:10. 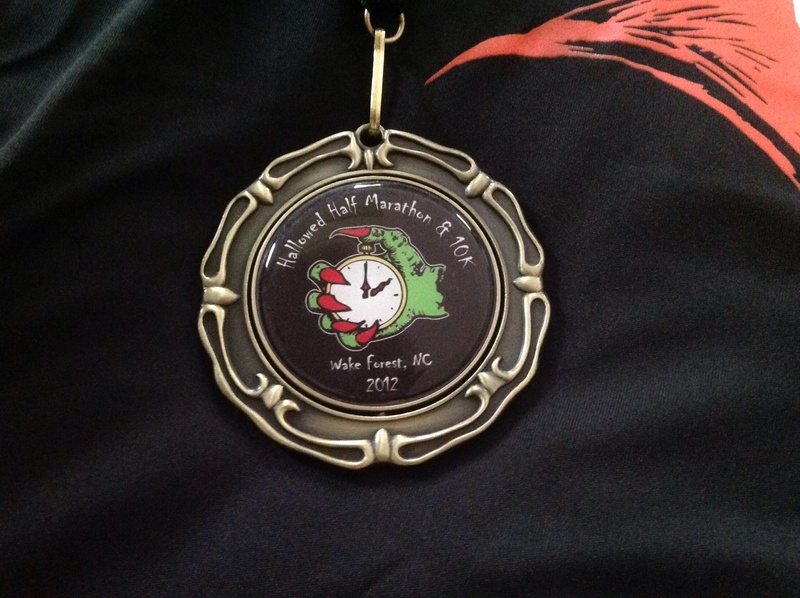 Then his second, the Mike to Mike Half Marathon, in Fayetteville, NC., in 1:51:50. He is now a freshman in college, and has been trying to train, but hasn’t gotten in the necessary miles. Not sure what to expect from him come race day, but knowing him, since the start and finish are at NC State (where he goes to college) he will give it 110%. This photo is over two years old. They are both taller than me now! My younger son (16yrs.) has yet to run a Half. This will be his first. He has been so busy playing on his varsity soccer team in high school this Summer and Fall, that he has barely had any time to train. He will be the wildcard on race day. He has certainly had his fair share of workouts, just not all distance running related. He is hardheaded like me, and I know will give it all he has on race day. Based on our varied training, I doubt that we will all run together. I wish we could, but that is probably unrealistic. If we all plan to give it our all, we will probably all run at different paces. It will be interesting, to say the least. How do you think it will turn out? It will certainly be a first. We’ve competed in shorter distances together, but never a 13.1. All I know is that the City of Oaks is about to get a handful of us. Will it be dear old Dad that arrives first at the tape? Will it be the college freshman with a PR better than my last two Halves? Will it be the High School Junior with something to prove? Surely it will be a blast! What do you think of holiday themed races? Do you run them? Like a Santa Hustle, Turkey Trot, Halloween Half, Firecracker 5000? It seems that more and more these days themed events can be found at almost any time of the year. 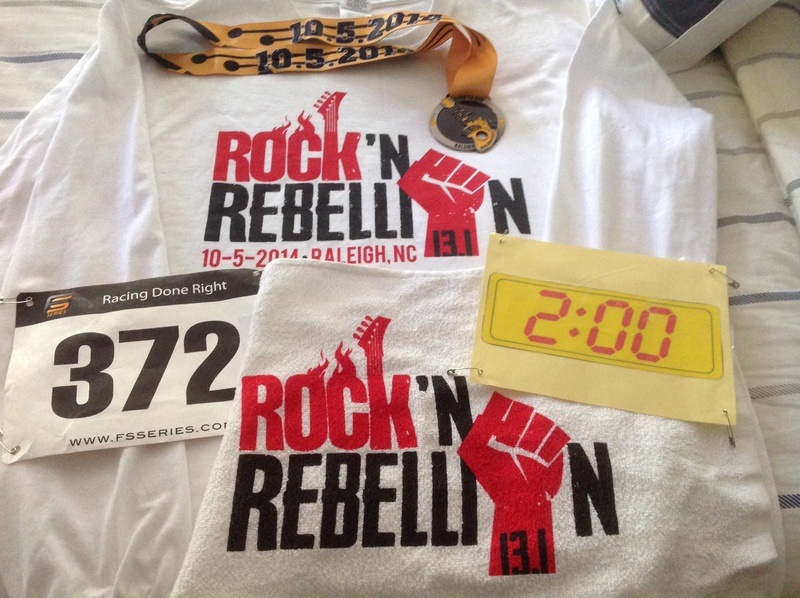 The past two years I have run the Hallowed Half in Wake Forest, North Carolina. Put on by running friend Sharon, of Signature Races, this is a growing event about to take place for the third time this Sunday. Most runners will don some sort of costume or themed running clothes to race in. It’s really a blast of an event, which also includes a 10k, as a less scary option. 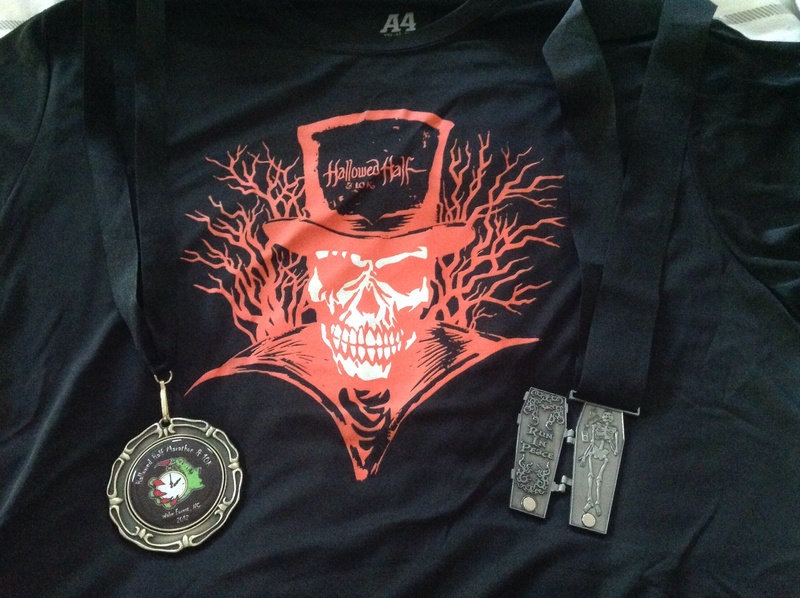 The Half Marathon is packed with rolling hills, and both races feature a haunted trail about a mile long filled with ghoulish decorations and costumed volunteers to entertain the runners. In 2012 (the inaugural year) I ran the Half in 1:44:49, and in 2013 I ran the Half in 1:39:00. Seems that having some experience on those hills helped me the second year. Well, this year I will be pacing the 1:45:00 group (8 minute mile). I am excited to once again pace a Half Marathon, especially one this fun. The shirts and medals have been great both years, and no doubt will be again this time around. There are very few races that I compete in year after year, but this is one of them. Looking forward to a hauntingly good time. This one is a coffin, and opens and closes on a hinge. What about you? 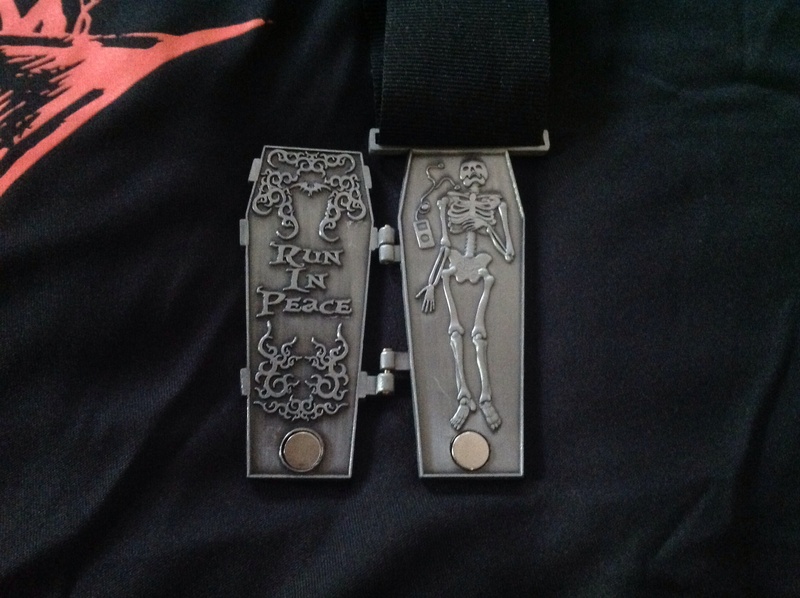 Are you running a Halloween race this weekend or next? Share any stories about great holiday themed runs that you have done? Feel free to share, as I’m sure there are many. October 5th, 2014, a beautiful morning to run. An even better morning to toe the line for a Half Marathon in beautiful Raleigh, NC. 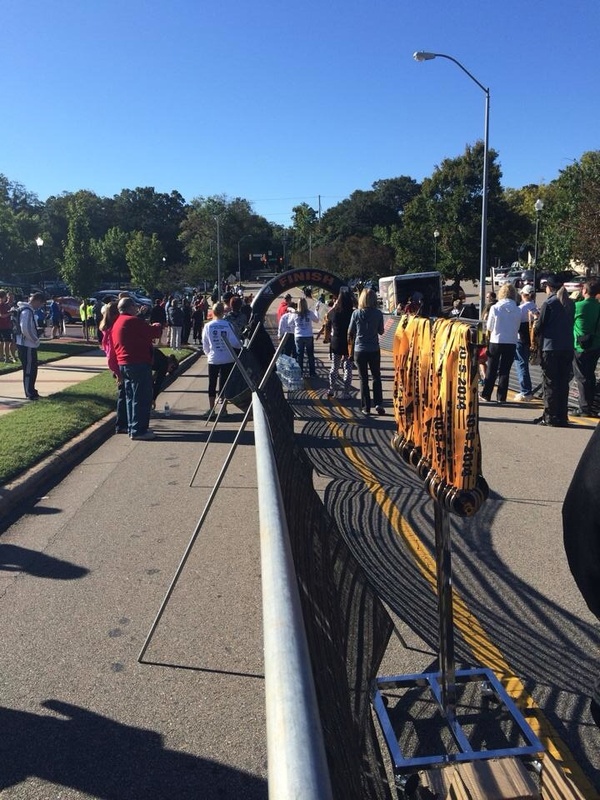 The 4th and final running of the local half marathon drew a big crowd. About 600 runners, and plenty of family support and friends showed up early yesterday morning at Cameron Village. 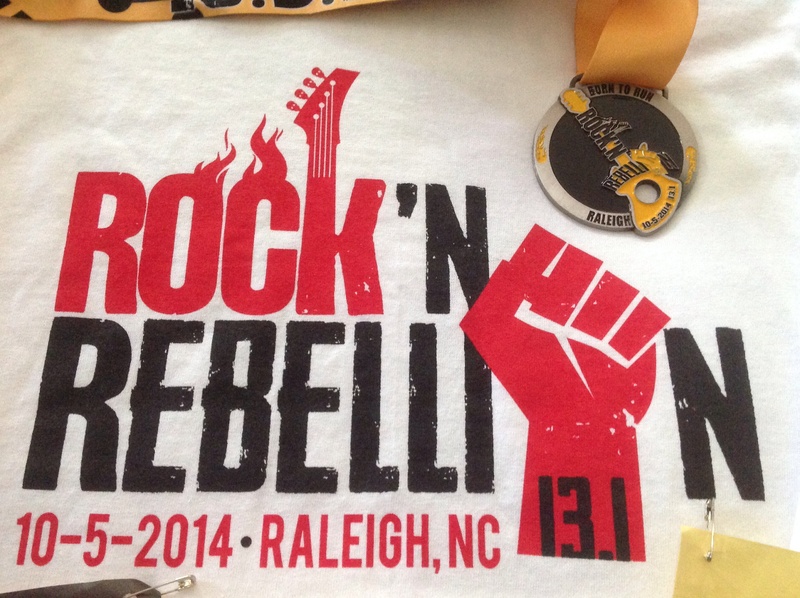 Local race director and friend of RunRaleigh Racing, Paula O’Neal, put on a well organized and highly rated event. I was asked to be a pacer for this event. I gladly accepted, although which pace team would work best for me was the question a few weeks ago when I was asked. Knowing that this race would be my final long run prior to the Chicago Marathon (7 days later), I opted for the 2hr pace group. I have had much success in the past when I’ve run a Half Marathon one week prior to a Marathon, but I have never gone “all out” during the lead up half. Choosing the two hour group would be perfect, although my slowest Half I the past was a 1:52:00 finish, so I really had to hold back to achieve the goal time. Race morning was perfect. Chilly, upper 40’s, and dry. I met up with my fellow pacer Yanni, who had made the pace flag, and pinned a 2:00 finisher bib to the back of my shirt. Funny enough, I had never met Yanni, although we are pretty comparable runners, and have raced in several races together, not knowing it. We started with a group of runners about 10 strong, that it could tell. We all exchanged pleasantries and quickly got into a nice groove when the race began. A short uphill start, and starting in the crowd, it took us about a half mile to get on pace. For a 2 hour finish, I would be tracking a pace of 9:09 overall. The race course was run on city streets, with about eight miles on the Raleigh greenways. A nice course and a challenge too, with a few hills mixed in here and there. We had a really fun group. Lots of conversation in the first several miles. We discussed past and future races, and kept each other on pace. This course had three or four greenway tunnels, so keeping the GPS signal was questionable. I only lost the signal on my Garmin once. We built in a little cushion in the pace, as the group requested we do this. Most of the group were pushing for sub 2 finishes for the first time, and obviously as a result of this, PR’s as well. I was excited to be helping these runners reach their goals for the day. About four miles in we were hovering at a pace of 9:01. That pace wouldn’t move on my Garmin for the next seven miles. We were in a comfortable groove. Yanni and I kept the group together, giving tons of praise, and encouragement. It really was a blast. One thing I noticed during the race, as there were two out and back sections with turnarounds on the greenways, was that every runner was happy. I have never seen such support and encouragement during a race before. We all cheered each other on. Runners were having a great time. I really didn’t see anyone struggling too badly. At about the 12 mile mark there is a fairly substantial hill to climb. We paced it perfectly. Some folks in the group dropped back, others held on with us. We worked together. I ran backwards at points, giving encouragement to those behind us to get up that hill. With less than a mile to go, our overall pace was 9:03. Those that kept with us would surely go sub 2, and earn awesome PR’s. When I could see the finish line, only about three city blocks remained, and all downhill. We were clearly ahead of pace, so Yanni and I really slowed down to get everyone to the line. We ran backwards for about a block, shouting out “let’s go”, ” get that PR”, and “finish strong”. Our group flew by us on down into the finisher chute well under 2 hours. Yanni and I made it to the finish and actually stopped about 10 yards from the finish, to offer words of encouragement to more folks for a minute or more. When there was a lag in runners, we walked across the finish line in 1:59:03. Chip time was 1:58:45. After receiving our medals, we met back up with the pace group runners, who were all waiting at the finish to thank us. I shook hands with no less than ten of them. All showing their appreciation for us, so happy with the results of the day. Big PR’s all around from the group, all sub 2’s, and thrilled. This race wasn’t about me at all. It was a comfortable training run, focus being on my group instead of myself. It was my slowest finish ever in a Half, but probably the most fun I have ever had racing. It was and awesome day, a day for giving back to my fellow runners. It was such a pleasure pacing this group. I’ve said it before, and I will say it again. If you have never had the opportunity to pace an event, I suggest you do. It is important as a running community that we help each other, and encourage one another. Pacing is a great way to do that, and if you are anything like me, it will give you a ton of satisfaction that you were a small part of helping someone else achieve a goal. I am pacing another Half Marathon in three weeks. At the Hallowed Half, I will be pacing the 1:45:00 group, and really look forward to that, as well. Rest, recovery and just a few short runs remain this week leading up to Chicago, just six short days away! Happy running everyone!